In January, I began installing Ubuntu Intrepid Ibex on all of my home computers. What this meant for me is that I was often without one because I screwed something up. 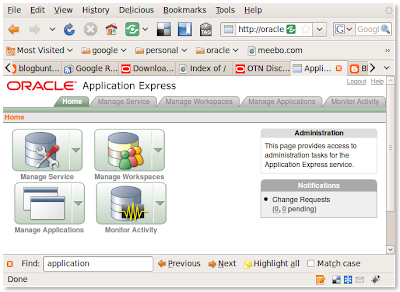 I even got so far as to install Oracle XE on Ubuntu which took 2 blog posts. Just before COLLABORATE 09, I installed Jaunty Jackalope on my laptop. 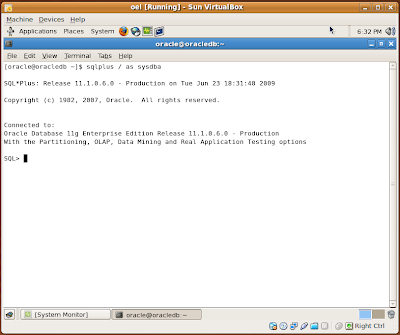 Then I got the crazy idea to install Oracle on Ubuntu. I ended up having to wipe the hard drive and start fresh. 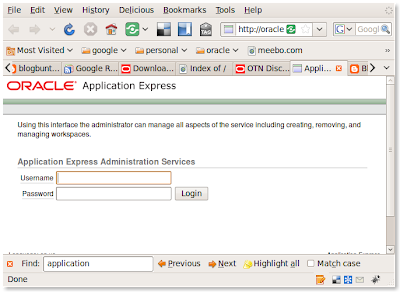 I have no doubt that it (Oracle) can be installed on Ubuntu, it just takes someone much more experienced than I. Armed with a fresh install, I was going the virtual route. Inspired, I believe, by this comment (Aman Sharma). I think that's the point I realized my first installation of Jaunty was hosed, and by hosed I mean unrecoverable by me. I couldn't see the 2nd partition, the one with all the room. 9. Connect from host machine. Now, you "really" got the oracle installed ;-). And I have to be a little bit disagree with the "ready-to-install" oracle distro part that you mentioned. I guess, its better like this otherwise, instalaation on linux too would be boring like over windows :). About APEX, that's a good... it's not difficult to setup, but it's so hard with me... when i need to test (example: create applications). Perhaps I've no idea to test about that. Sorry about that. I picked that up from your profile...I thought it looked different. Updated now. Hey, I gotta complain about something right? Overall I think it was pretty easy to do. It was just overwhelming initially. I love me some apex. Never had it so easy in creating apps. The funny part is that hardly anyone (around Tampa anyway) uses it. I keep plugging away though. No issues, I had an idea that you piked it up from the profile only. I created that blog for writing about oracle than happened to have my website and got the blog set up there. Hey, I gotta complain about something right? Yes sir, you sure can do :) . Overall I think it was pretty easy to do. It was just overwhelming initially. Haha when I did it for the first time, I said the same, heck it was easy ;-) . But still, the feeling is great IMHO. One actually feels that he has done some thing before doing the click-click thingy. I agree. I felt like I did accomplish something. It's funny though, because I'm perfectly comfortable using SQL*Plus (~7 years now), but I always shied (sp?) away from *nix. I'd try once a year or so, but never got it.